The North Atlantic Oscillation is a weather phenomenon that affects the jet stream and can alter weather patterns in some parts of the world. Why do I care? Recent studies have shown that the North Atlantic Oscillation has an impact on weather patterns in the eastern United States depending on how strong it is. Figure A. 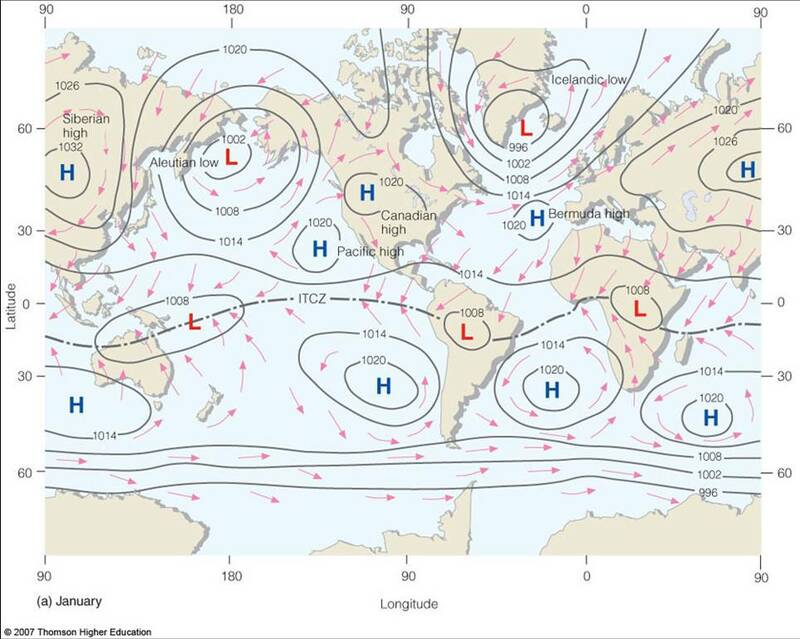 Pressure systems that affect the North Atlantic Oscillation. The North Atlantic Oscillation (NAO) is a periodic variation in the strengths and positions of the Icelandic Low and the Azores High. The Icelandic Low is a semi-permanent low pressure area sitting close to Iceland, while the Azores (Bermuda) High is a semi-permanent high near the Azores. The Icelandic Low and Azores High fluctuate in strength and position over a period of months and years, and their variations can have an effect on weather in the eastern United States by shifting the location of the jet stream which affects temperature and precipitation patterns over the southeastern United States. The fluctuations vary in their duration and strength from one swing to the next, which makes them difficult to use in detailed climate predictions. But how does that have an effect on weather in the U.S.? Iceland is thousands of miles away, and I’m not even sure where the Azores are! The NAO goes through two phases: a positive phase relating to the strengthening of the Icelandic low and the Azores high; and a negative phase relating to the weakening of both the Icelandic low and Azores high. During the positive phase, the strengthening of the two semi-permanent pressure centers results in an increased pressure gradient over the North Atlantic. This would be like taking a valley and mountain, increasing the depth of the valley and the height of the mountain, and then looking at the slope between them. The steeper slope is analogous to the increase in the pressure gradient. As a result of the stronger pressure gradient, the westerlies increase in speed, allowing the cold air to drain off the North American continent rather than letting it build up and move south. As a result, the eastern United States often experiences a wetter pattern with stronger storms during the winter season due to the increased upper level winds. Across much of the southeastern United States, warmer than normal temperatures prevail and impact the growing season of some crops. Figure B. Phases of the North Atlantic Oscillation. (Image from NCEI). During the negative phase of the NAO, the weakening of the two semi-permanent pressure centers causes a decrease in the pressure gradient across the North Atlantic. This results in the weakening of the westerlies which allows cold air to build up over Canada and move south via a deepening trough which affects the eastern US. During the winter season, the southeastern United States experiences a colder and drier season with the negative phase of the NAO. The eastern US is likely to experience above average snowfall during the winter, which has grave impacts on crops. It should be noted that the NAO can work with or against other large-scale weather systems. For example, if the NAO is going through a positive phase and there is a strong La Niña occurring, the combination of effects means that temperatures will more than likely be much warmer in the Southeast than what they would be if only affected by the NAO.